We begin taking applications for the 2015-2016 school year after our Open House on Wednesday, Jan. 28, 2016, at 6:30pm. We will be inviting all interested students and their families to apply to The Grove from Kindergarten to Gr. 6 under Optional Attendance. The deadline for applications is Friday, Feb. 19, 2016. Note that for Kindergarten, you can apply to The Grove in the year your child will reach the age of four. Admission to our full day Kindergarten program is in high demand and should we receive more applications than we have places for, admission will be based on a fair lottery system. All applicants will be notified before the end of March if they have received a spot or have been placed on the wait list. The Grove is unfortunately not able to accommodate visit requests at this time. 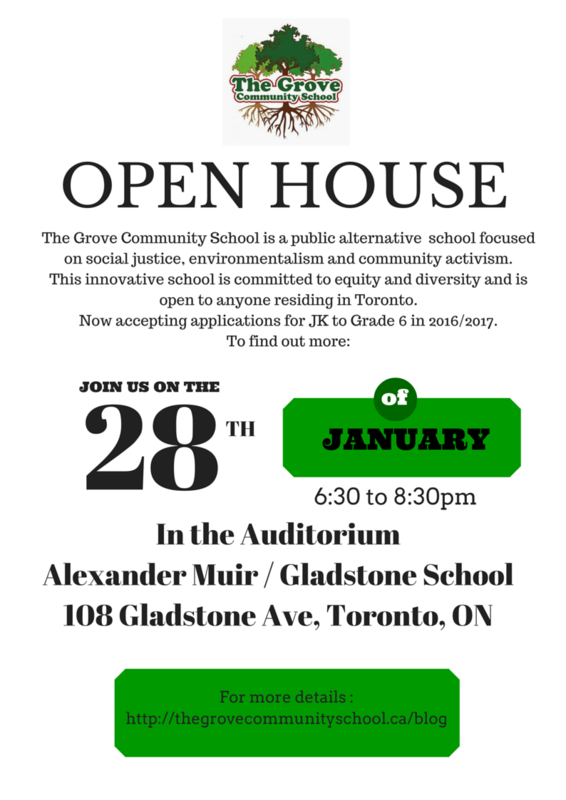 Please come to our Open House, January 28, 2016, at 6:30pm, where you will have a chance to ask questions while you visit the school. Teachers, students, and parent representatives will be present to introduce you to our wonderful community.